Recently a new mandolin bridge design has been developed by the American musician Red Henry, together with a number of other people from the Internet community. I was one of a number of people from the Internet community who contributed and I thought members may be interested in the results, hence this article. We are all grateful to Red Henry for having the original idea, the efforts he put into developing the idea, and in sharing it with so many other people. In my humble opinion this development is a significant advance in mandolin bridge design. The work is still on going and readers can gain more information about the development of this bridge from the Net (http://www.murphymethod.com/redbridge.html). Recently Red has reduced the foot size of the bridge and has reported tonal improvements. This article describes my contribution to the project. 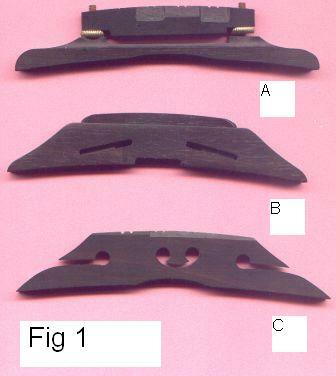 The mandolin bridge referred to in this article is the bridge used in carved top mandolins originally developed by Orville Gibson and later refined by the Gibson company. Gibson originally used a solid Ebony bridge, which was later refined into a two piece adjustable Ebony bridge, known as the "Loar" type of bridge (see Fig 1A). This bridge became the standard type of bridge used for carved top mandolins, and is still commonly used today by most modern makers. In recent years Vern Brekke from the Sound to Earth company (STE) developed and patented a new bridge that was designed to overcome many of the short comings of the Loar type of bridge. This bridge has gained some acceptance amongst some players and makers (see Fig 1B). However, the Brekke bridge is somewhat controversial, with many people preferring the sound of the Loar bridge, others preferring the sound of the Brekke. Personally I prefer the sound of the Brekke bridge, and use it on my own mandolins. The Brekke bridge is specifically designed so it does not tip foreword, and the saddle does not bow or break, which some Loar type bridges have a tendency to do. It only has Ebony/Ebony/soundboard contact, unlike the Loar type of bridge which has Ebony/brass/Ebony/soundboard contact. It is adjusted by two small allen bolts from the side. To my ears it has a smoother, warmer tonal quality over that of the Loar type bridge. The thinking behind the new mandolin bridge is to use the principles of the violin bridge to improve the sound of the mandolin. Red Henry reasoned that Maple is used in violin bridges so why not use Maple on a mandolin. Most of the developments of the new bridge, which I will now call the "Henry" bridge has been done using Maple,although Red and myself, and some others have tried other woods. Red claims to get the "best" sound quality from quarter sawn European or American Rock Maple, but opinions are divided. My own design of the Henry bridge is pictured in Fig 1C. I have got best results from Ebony. In my opinion, Ebony has given me improvements in sound quality miles in front of any other wood I have tried, including Maple. Violin makers will immediately notice from my Henry bridge that the outside strings have solid wood underneath them, unlike a violin bridge. My experiments with Maple Henry bridges have shown that if the wings of the bridge are cut underneath the E strings, the mandolin becomes unbalanced with the E strings sounding somewhat "dead". This is not so critical for the G strings. 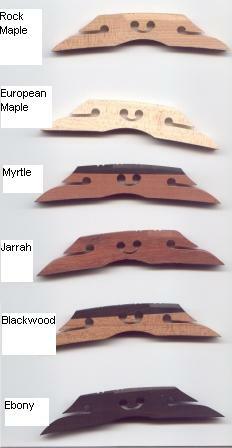 Thus for mandolins, unlike violins, it is essential the outside strings are supported by solid wood. Below I have summarised the results of some trials of various Henry bridges that I have made. The Myrtle and Blackwood bridges were topped with Ebony because I found that Myrtle on it's own was unsatisfactory. In all cases I had two identical mandolins that I had made so I could use one instrument as a reference. The reference instrument had an Ebony Brekke bridge installed. STE kindly supplied me with a Brekke bridge made from Maple so I could compare absolutely identical bridges of Maple and Ebony. The reference bridge was an Ebony Brekke bridge as supplied by STE, and the comments below reflect the differences I heard between the experimental bridge and the Ebony Brekke. My impressions of each bridge was checked with one other person, who consistently agreed with my conclusions. All bridges were made from quarter sawn timber, and were as close to identical as I could manage by hand except for bridge (7). This bridge was thinner than the others. A small increase in volume. This bridge sounded brighter and with a thinner, harsher tonal quality. Maple Brekke bridge - thinner and harsher tone. Similar to (2). No perceptible change in volume from (2), but some deterioration in tone. I preferred the sound of the Rock Maple bridge. Very good bass, poor sounding treble. bridge so was a bit of a disappointment. (6) Blackwood topped with Ebony. Big increase in volume. This bridge was the loudest of all the bridges I made. Sweet and bright sound. Somewhat thin sounding bass. Promising sound, but too bright for my ears. Increase in volume, but not as much as the Maple or Blackwood bridges. Smoother and sweeter tonal quality. The improvements this bridge made to the tone of the mandolin was striking. The instrument was transformed into a much better sounding mandolin. Best sounding bridge. Louder and smoother tone than (7). Big improvement on the Ebony Brekke bridge. This is the bridge I installed on my own personal mandolin (see Fig 1C) and used it for some 6 months before switching to a modified Brekke (see below). The Henry bridge does have quite a profound effect on the sound of the mandolin and can improve both volume and tone considerably. The difference is immediately obvious and is not subtle. To a player it is like playing your familiar favourite mandolin, but it sounds like a completely different instrument. My own investigations have indicated the traditional Ebony has given me by far the best tone, but most of the experiments by others (including Red Henry) into this new bridge design has used Maple. Opinion is divided about whether Maple or Ebony is the best material to make the bridges from. Bluegrass players appreciate the extra bite and volume of Maple, whereas other players, such as myself, don�t like the thinner and harsher tone of Maple. The bridge can be tailored to the individual instrument, similar to how violin bridges can be adjusted by changing the wings, and the mass of the bridge. My experiments have indicated as a rough approximation that lighter bridges give a louder and brighter sound. The wings also increase volume and add warmth. To understand why the Henry bridge has such a large effect on the sound of a mandolin, one needs to examine some of the research on violin bridges (see Fletcher and Rossing, The Physics of Musical Instruments for a summary) . Violin bridges have two main resonant modes. One is an up and down motion, the other is a twisting motion. Drilling holes in the centre of the bridge will increase flexibility and should enhance the up and down motion. Adding wings will increase the twisting motion. Indeed, a Henry bridge built with asymmetric wings is not as effective as a symmetric bridge which is what would be expected if the bridge was undergoing a twisting motion. The disadvantage of the Henry bridge is that it is not adjustable like the Loar style of bridge or the Brekke bridge. The bridge needs to be made specifically for a particular instrument, and putting the mandolin in a dry environment, or fret wear can cause buzzing which can only be solved by making another higher bridge, or in the case of fret wear, a refret or fret dressing. Also, brand new mandolins tend to settle a little over their first few months of life, so a non adjustable bridge becomes impractical for someone such as myself who exports instruments overseas. An additional problem is that different musicians prefer a different height of action, and often customers cannot tell me exactly how high or how low they prefer their mandolin to be set up. A non adjustable bridge will fix the action permanently so an adjustable bridge is a big advantage. Can we apply some of the techniques learned from the Henry bridge to an adjustable bridge? The Loar type of bridge is not suitable because drilling holes in the saddle will almost certainly cause the saddle to bend or break. I therefore decided to try to improve the sound of the Brekke bridge, once again by using an identical reference mandolin with a standard Brekke, and changing a Brekke bridge on my own instrument. There is not much I could do about adding wings to the Brekke bridge because of the design, but there are other things that can be done to reduce mass and improve flexibility. First experiment was to thin the bridge base down to 1/4 in at the base and tapering to as thin as I dared so the bridge is wedge shaped. The shape then is similar to my Henry bridges. This is a fairly low risk modification since the base of the Brekke bridge is very stiff and strong. This modification produced a noticeable increase in volume and the mandolin became more resonant and responsive. Not nearly as much as the Ebony Henry bridge, but still significant and well worth while. The next experiment was to drill two holes in the centre of the saddle and to join them with a cut similar to how I made the Henry bridges (see Fig 2). This will weaken the saddle significantly so does involve some degree of risk. Fortunately the Brekke saddle is strong enough such that the saddles I have modified so far have not collapsed or sagged. This modification produces quite a significant improvement in the tone of the mandolin, particularly in the treble. All in all these two modifications removed just under 3gm from the weight of the original Brekke bridge. The next experiment was to take the original Brekke Bridge I used as the reference, modify it and compare it to the Ebony Henry bridge. Much to my surprise, I preferred the sound of the modified Brekke. Volume was about the same, but I thought the modified Brekke had a sweeter treble.